Academic realism has been taught at Chinese art academies since the 1940s and continues to be a main technique influenced by classical European art and individual artists such as the American painter Andrew Wyeth. While some of the artists of the first two post-revolution generations depicted the harsh realities of rural poverty and misery with a humane concern, there emerged a third, more despairing generation of artists. Fang Lijun epitomises the generation that adopted a kind of 'rogue cynicism' which reflected their acute feeling of the meaninglessness and hopelessness of their own lives and society. 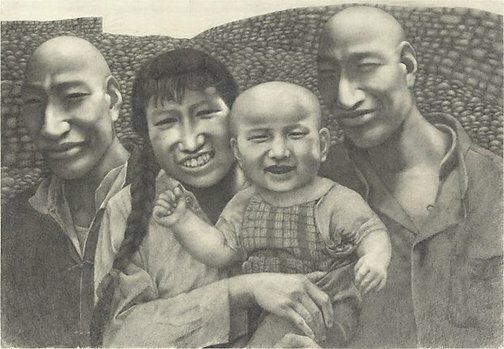 These drawings were among those the artist prepared for his graduation assignment at the Central Academy of Fine Arts in Beijing. The Asian Collections, AGNSW, 2003, pg.178., Academic realism has been taught at Chinese art academies since the 1940s and continues to be a main technique influenced by classical European art and individual artists such as the American painter Andrew Wyeth. While some of the artists of the first two post-revolution generations depicted the harsh realities of rural poverty and misery with a humane concern, there emerged a third, more despairing generation of artists. Fang Lijun epitomises the generation that adopted a kind of 'rogue cynicism' which reflected their acute feeling of the meaninglessness and hopelessness of their own lives and society. These drawings were among those the artist prepared for his graduation assignment at the Central Academy of Fine Arts in Beijing. The Asian Collections, AGNSW, 2003, pg.178. The Asian Collections Art Gallery of New South Wales , 'The Shanghai School and Modern Painting', Sydney, 2003, 178 (colour illus. ).